If you want to try InfoBarrel you can get a free account by signing up here. To be completely honest most people that are members of InfoBarrel use it for one of two reasons. They use it to make money directly or to make money indirectly by building backlinks to their money sites. Neither is a problem and neither is better than the other. The whole point of the site as they bill it is to help you make money; it’s up to you to do it however you want. Most members, myself included, make money on the site a few different ways. The site shares its ad space on each article with every author. You setup an account with the major web advertising companies (Adsense, Chitika, and Amazon) and you provide your ad code to InfoBarrel and your ads will show most of the time on your articles and the webmasters ads will show a minority of the time. Chitika is an advertising company that bases most of its ads on the search term used by the reader in finding your page. Most writers with a large library of content make a small percentage of their overall earnings with Chitika but it is consistent. InfoBarrel shares 75 percent of your Chitika ad impressions with its writers. You can sign up for Chitika here. Similarly Info Barrel shares 75 percent of Amazon ad impressions with its publishers however the Amazon advertising block is not used on any articles unless the publisher chooses to show it. This is a nice feature because it gives publishers control over how many advertising blocks on their material. This can be good for topics where advertising isn’t very efficient or for publishers who do not like as much advertising next to their work. You can sign up for Amazon Associates here. The meat and potatoes of earnings that writers for InfoBarrel make is from contextual advertisements served up by Google’s Adsense advertising network. Publishers who setup an Adsense account can include their ad code on their article from anywhere between 75 percent of the time up to 90 percent of the time. This is an industry leading ad share percentage and is one of the primary reasons why many publishers feel that writing for InfoBarrel is the best place for them. There are other websites like InfoBarrel that share ad space but none share ad space at such a high percentage as InfoBarrel. In addition to this type of contextual advertising revenue many members are also able to directly monetize their articles by including direct affiliate sales links to various digital and physical products sold around the web. Many affiliate marketers sell products through Amazon.com and others go through smaller affiliate programs which are abundant in the online world. InfoBarrel doesn’t really have a strict policy in regards to affiliate sales but they simply state that affiliate sales is ok so long as the publishers are not overly aggressive or deceptive in their publications. One of the underutilized features of InfoBarrel which many traditional businesses could significantly benefit from is the ability to market their own business by publishing topical articles on their field of business and then linking back to their main business website. For instance if you have a plumbing business in Seattle you could publish articles about plumbing related topics and include links back to your small business website. This benefits the small business owner in three ways. It is the start of an alternate stream of business related income; it slowly builds up referral traffic to the small business website from readers who read their articles and click through to the small business website; and it builds the authority of the small business website through targeted and contextual backlinks so that it is easier for people to find the website in the main search engine results pages. This can potentially give a small business greater visibility in their line of work in their local region. As a plumber you may end up getting more clients and customers buy improving this aspect of your websites visibility in the search engines. InfoBarrel can be invaluable to traditional small businesses through this one feature and it is a significant benefit that cannot be understated. What is InfoBarrel? How Can InfoBarrel be used to improve your life or the life of your business? Why is InfoBarrel worth your time? InfoBarrel provides a means for you to publish content and make money from that content, sell products through that content, and promote your small business through links from that content pointing to your business website, blog, or other online property. Info Barrel is a free service and it has a thriving community of users who help each other improve the site and their performance using the site. It is user friendly and the ownership of the site seems genuinely interested in helping it’s users achieve financial stability and success. InfoBarrel can offer a lot for seasoned writers or for novice writers. Content publishing is not topically restricted (so long as you stay away from taboo subjects) and allows you to speak in whatever tone you like. There are publishing guidelines but they are not very restrictive and they are easy to follow. If you are a seasoned content publisher or blogger you should give InfoBarrel a try and see if it fits into your plan and if you are new to content publication then you should give InfoBarrel a try and see if it can benefit you or your business because the chances are high that it can. If you have any specific questions about InfoBarrel or this InfoBarrel Review make sure to drop them in the comments below. I’d be happy to answer them as best as I can. I’ve been an active of InfoBarrel for since November 2009 and I can answer most questions… and if not I can point you to someone who can. Good luck. If you'd like to give InfoBarrel a try then click here to start a free account. 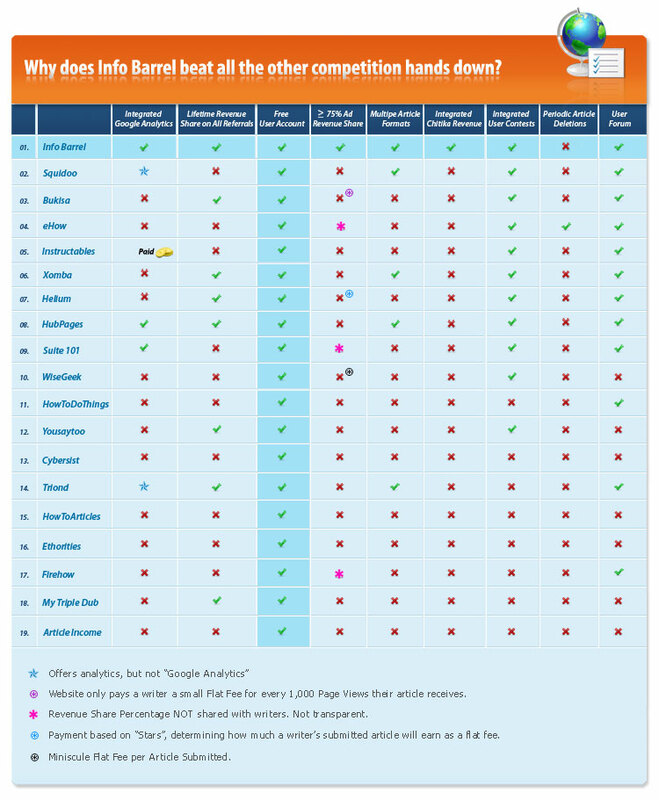 Here is a chart which was made by a fellow InfoBarell member comparing InfoBarrel to other similar publishing websites online. If you like visuals this chart may help you see why InfoBarrel can be helpful. I never seem to earn anything on Chitika - but I'm signed up though and I can always hope. Infobarrel also has a nice long list of achievements you can unlock. They don't help you earn more but are a good way of tracking your progress on the site and building credibility with readers and other writers. Hey Jade - as of this writing I'm on pace for about $70 this month on Chitika - about three months ago I was getting about $1/month so there has been a notable improvement as of late. Nice review chez/Brian! I am loving InfoBarrel more and more every day. I can't wait until I start reading blog posts about you making a couple thousand dollars a month from them. It will happen eventually (I know you know it too). The worse part is waiting for it to happen! LOL, good luck man keep up the great work on this blog and IB! Thanks Travis - I know my first $1000/month on IB isn't that far away and $2,000 is just a hop skip and a jump past that. It will happen and I can't wait. Thanks for stopping by. I think that the primary reason why people write for Info Barrel is because of the backlinks and money involved - which can both benefit business owners and writers wanting to make a side residual income. By the way, $70 with Chitika? That's downright amazing! Looks like you're doing quite well writing for Info Barrel. Keep it up! I enjoy following your progress with Info Barrel.